Do you need a dynamic speaker for your civic, fraternal, business, or church organization? More than 44 million Americans are currently caring for an elderly loved one. Over one-third of those individuals are working. Many people find themselves trying to juggle their careers, tend to their own families, and care for a senior. It is a problem that almost everyone will have to face. People delay addressing issues with senior loved ones due to guilt, denial, and the fear of limiting a senior’s independence. When the senior experiences a life-changing event, it is always a crisis. The solution to the problem needs to be addressed immediately. The senior is normally facing financial challenges as well. Andrea Donovan is a Senior Housing Consultant and Certified Geriatric Care Manager who has more than 15 years of experience as a professional speaker on the topic of Chicago Senior Living. Andrea has analyzed and evaluated over 450 senior living communities in the Chicago Metropolitan Area according to cost and method of payment, level of care, quality of care, staffing, housekeeping and amenities. As a professional speaker and Senior living expert, Andrea receives frequent requests to lecture on what can be a very daunting task: How to choose the right senior living option for a senior loved one. 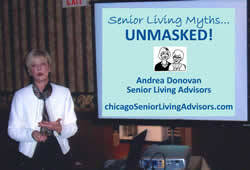 Andrea Donovan's free presentation, “Senior Living Myths Unmasked – Separating Fact from Fiction,” addresses what can be a daunting task: finding the right senior living option for a loved one. Andrea has evaluated more than 250 senior communities in the Chicago metro area, and will prepare audience members for what they may encounter during their senior living search. 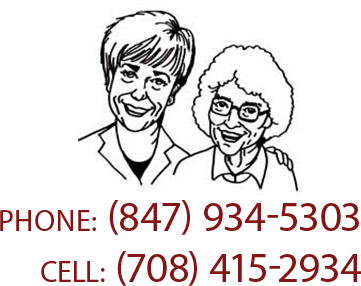 This presentation is ideal for anyone caring for an elderly loved one. Andrea has a Bachelor’s degree in Speech Communications from St. Mary’s College, Notre Dame, Indiana. She has prepared speeches that address the process of preparing a loved one to enter a long -term care community, how to choose the best Chicago assisted living community or nursing home for specific health circumstances, how to successfully interpret the 5-star rating system designed by the Centers for Medicare and Medicaid, and how the current governmental administration may affect the future of programs for seniors. As an expert speaker on Chicago Senior living, Andrea can custom design a presentation based upon your specific needs and interests.